Some people are concerned that the recession will be bad for kids' dental health. When the school dentist invited questions, the third-graders were ready. And they weren't asking about how often they should floss. Dr. Richard Gruffi, wielding a giant set of choppers, a 14-inch-long toothbrush and a disgusting prop called “Mr. Dirty Mouth,'' turned most of the questions into lessons on basic dental care. Then he went down to the nurse's office, set up his portable dentist's chair and started giving free checkups, cleanings and sealants to children at the Siragusa School in Yonkers. By all appearances, it's a welcome, successful program. But these days that's no insurance against budget cuts. 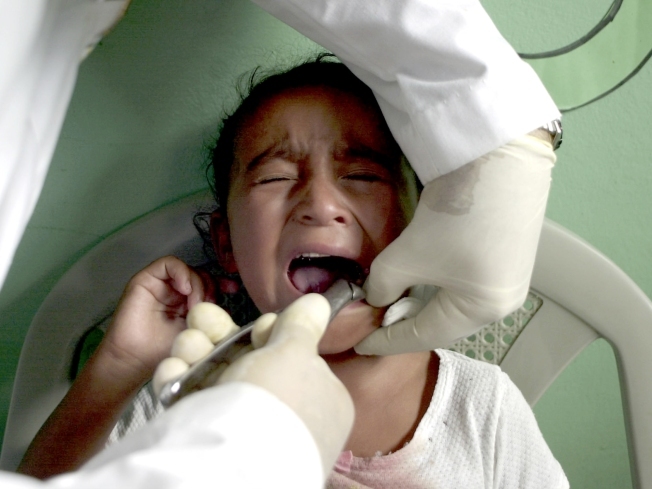 Experts say children's dental health may become another victim of the recession. Gruffi's work is part of a state-funded program in Yonkers, just north of New York City, that brings basic medical care into four low-income schools. “We get the kids early, the parents don't have to worry about appointments, we save everybody some pain and some money,'' said Gruffi, 58, as he cleaned the teeth of fourth-grader Malaysia Wade, very cooperative behind the disposable sunglasses the dentist puts over the kids' eyes so his light won't be too bright. Since 2001, Gruffi has treated about 500 kids a year as director of dental health for the Westchester County Health Department. A program in Yonkers is not in immediate danger, but county health spokeswoman Caren Halbfinger says funding cuts would not be surprising given New York state's gaping budget problems. In New York City, Mayor Michael Bloomberg has proposed closing dental health centers citywide, many of them in schools, that serve some 17,000 poor children each year. He says that would save $4.4 million a year. Even where programs continue, though, the recession poses another danger to the children's dental health: families' unwillingness to spend. Because he deals only with basic dental health, Gruffi writes to parents, suggesting a trip to another dentist if he finds cavities or abscesses or crooked teeth. He says there is evidence that families are cutting back on dental care as money tightens. According to a December survey by the American Dental Association, 53 percent of dentists reported an increase in the amount of time they don't have appointments. “With private insurance and patient out-of-pocket payments the primary source of dental expenditures, fear and unemployment are difficult conditions,'' said Wayne Wendling, managing vice president of the ADA's Health Policy Resource Center. He said patients are reluctant to spend for dental services other than acute care. Assemblywoman Amy Paulin, a Westchester County Democrat, successfully pushed for a law last year that requires schools to send dental health forms along with medical forms to families when a child is starting school. But she could not win approval to make the dental checkup mandatory. “When did we sever the mouth from the rest of the body?'' she asked. The ADA is trying to help. On Friday the organization hosted Give Kids a Smile day, with 45,000 dental professionals providing free services to as many as 500,000 low-income children. And a new law enacted Wednesday by President Obama could result in more state programs for children's dentistry.